Home / Blog / A Master Triathlete Gets His Running Mojo Back with Regenexx! 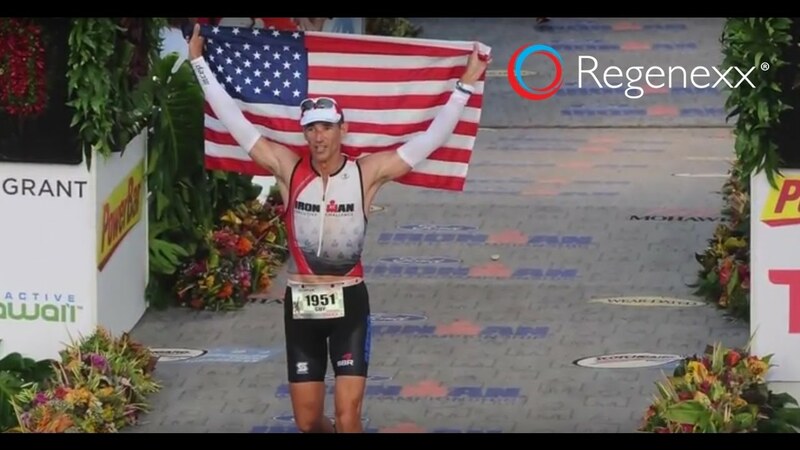 A Master Triathlete Gets His Running Mojo Back with Regenexx! Can a stem cell treatment for knees get a Master Triathlete back to running at peak levels? Guy is a successful and award-winning businessman and four-time USA Triathlon All-American athlete. He’s competed in the 70.3 IRONMAN World Championship, finished 10 IRONMANS, 40 half-IRONMANS, and over 100 triathlons. Exercise has always been a major source of stress relief in Guy’s life. However, in 2013, at IRONMAN Germany just two days before the race, his L4–5 disc ruptured, causing paralysis down the front of his right leg. His back issues ultimately led to problems in the cartilage and meniscus of his knee. After running, his knee would be sore for days, and he was told numerous times his running days were over, a devastating blow to an athlete who’d been extremely active since he’d been a wrestler in junior high. A natural shock absorber in the knee, the meniscus not only supports and protects the cartilage, it also helps guide the knee bones. In runners and active people, like Guy, the meniscus may be important in protecting the cartilage. Many people think that when they’ve injured their meniscus, getting a meniscus-repair surgery will get this structure back to optimal performance, but in reality more than 90% of the time, the torn meniscus is being excised, not repaired. Calling it a “repair” is misleading because once parts of the meniscus have been removed, there is no way to put it back or make it like the original. Without a fully functioning whole meniscus, running and other activities are difficult, if not impossible. Guy had three back surgeries as well as a number of meniscus surgeries, where surgeons removed tissue and cartilage. He points out in the video that this tissue is now “basically gone forever” and that he did not want to lose any more cartilage in his knee. Guy changed course and after finding Paul S. Lieber, MD (our Pittsburgh affiliate), he decided to use a stem cell treatment for knees as well a the Regenexx approach to treating his back. After receiving regenerative injections in his back, Guy shares in the video that he no longer has any back pain. Even more important to Guy is that with the stem cell procedure to his right knee, his knee pain and symptoms have subsided, his knees feel 10 to 15 years younger, and not only is Guy running again, he qualified for and competed in the 70.3 IRONMAN World Championship in Australia in September of 2016. The upshot? Be sure to watch Guy’s inspiring video above. His experience shows that even if you do seem to be on a revolving cycle of surgery after surgery, a Regenexx stem cell treatment for knees or any other joint can still be a solution to helping you stop the surgical madness. In Grand Cayman right now getting ready to go in around noon for the bone marrow aspirate to begin the process of culturing my stem cells. I am due into the Caymans for the aspiration at the end of April. I am a very active skier with knee issues, I have had one knee replaced but hope the stem cell treatment will help the other knee. I would be very interested in your progress and observations.